In recent years, yerba mate has found its place as a gourmet ingredient. Everywhere, restaurant chefs are finding creative ways to turn yerba mate into the most exquisite platters. 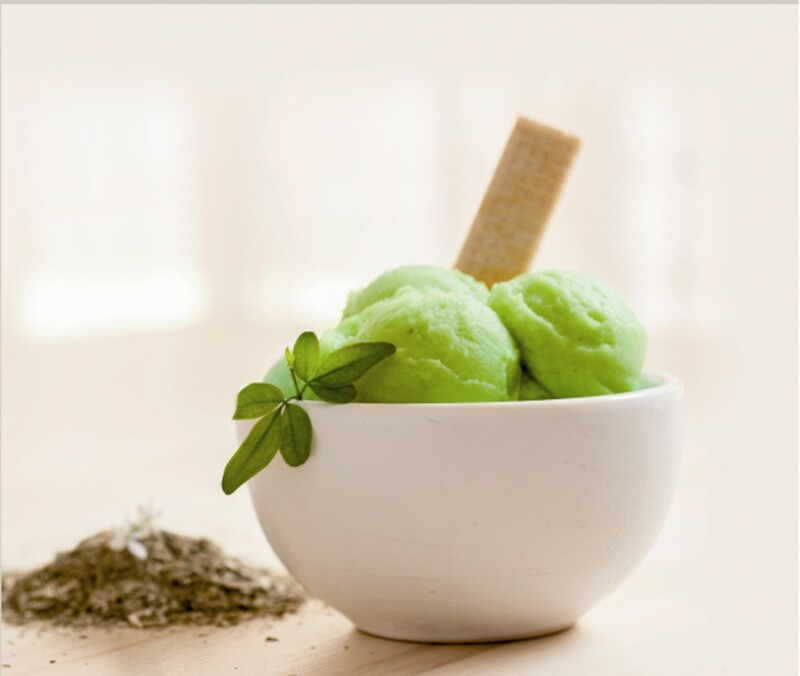 In this article, we will introduce a delicious and creamy yerba mate ice cream recipe, which is sure to appeal to all your senses. Well, its almost november and perhaps this recipe comes a little too late for all of us living in the northern hemisphere, but let’s give it a try anyway! This will be a very simple recipe, which can be easily prepared at home. The result is a very delicious ice cream which combines the herbal and earthy touch of yerba mate with the creaminess and refreshing characteristics of a good old ice cream. Those who have tried it, guarantee that it is a total success with the guests and in Argentina it has become one of the favorites with the tourists. This recipe is best prepared with an ice cream machine. If you don’t have one at home (and most of us don’t), you will have to remove the final mix from the freezer and mix it with a spoon every 15 minutes or so in order to avoid ice crystals from building up. In total, you will have to repeat the process about 6 times. Heat up 2 cups of milk in a pan and remove it from the stove as soon as it begins to boil. Add the 2 teaspoons of yerba mate. Let the infusion rest for about 30 minutes with the lid on. Filter the infusion with a sieve and heat it up again without letting it boil completely. Meanwhile, mix 5 egg yokes with 1 cup of sugar. Stir is continuously until it becomes white and foamy. Now pour in the hot milk infusion while stirring. Take the mix back to the stove in low heat and keep stirring with a wooden spoon. Do this until the mix becomes thick, while never letting it boil. Test the mix by placing a little bit on a spoon and separating two halves on opposite edges of the spoon. If both halves don’t slide back to the middle, then your mix is ready. Remove from the stove and let it cool a bit. Add whip cream to thicken the mix if necessary. We are aiming for a creamy texture, but shouldn’t be as think as Chantilly, for example. Mix the whip cream slowly in and let the whole mix cool down to room temperature. Pour in a rectangular-shaped dish and take to the freezer. Read the observation above. Remove from the freezer every 15 minutes and mix slowly to guarantee a creamy and homogeneous body. So that’s it, folks! What are you waiting for? Go try it out and if you have time, let us know how it went in the comments below! Happy stirring!